Wait, please! Rice balls are the very food Japanese people have long loved. Every convenience stores sell them all over Japan. The combination of slightly-sweet rice, grains of salt, and the dried laver seaweed has a fine balance of tastes. Please give it a try. Human beings need a wide variety of ingredients and nutrients. Of those, Japanese people have long and specially been fond of rice and Japanese cuisine is designed to go well with it. Sukiyaki or Tempura is not suitable for eating together with bread. This is where rice comes in, let alone sushi. Sake is also made from rice. It is not only used for drinking but also for seasoning like wine. 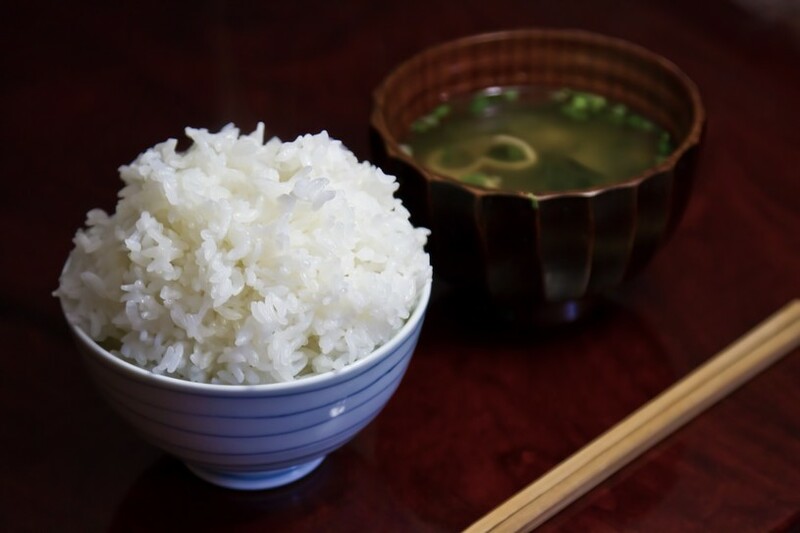 Rice is an inextricable part of Japanese food and even history which can be said a story of rice and Japanese. Today the population of Japan is approximately 126 million. On the other hand, before rice farming started, the Japanese archipelago has a population of no more than 100,000 to 200,000. Mountainous topography and an abundance of seafood made eating easier. People could live their lives by hunting- gathering. Rice farming gradually became widespread in Japan when Roma and Carthage began fighting bloody battles over again. At the age, Chinese continent was also in the midst of the war-ton era. I guess many people living in China, in particular, around Yangtze delta made their way as “refugees” to Japan. It is because rice is basically tropical plant and has been grown abundantly in the area from Yangtze delta to south-eastern Asia. It was from then on that the population expansion started in Japan since Japanese also took up farming. Around the beginning of 7th century, the number of the population had expanded to estimated 5 million. (c) 2015 HOKKAIDO GOVERNMENT ALL RIGHTS RESERVED. To grow rice which is rich in nutrients, exhausting labor-intensive work was absolutely necessary. When letting water flow to rice fields, civil engineering technology to make the ground level is indispensable. The hardest work is to transplant rice seedlings to rice fields in mud water. Farmers crouch their back and transplant them piece by piece and finally they are all covered with mud. To get over the arduous tasks and add a touch of entertainment, a performing art of “Dengaku” meaning “enjoyment in rice fields” was developed. As you can see the Image 5, a stage is set up in the center of a rice field and entertainers encourage farmers by singing, dancing, and playing musical instruments. The Dengaku became gradually sophisticated and was evolved into stage art “Noh” which every people could participate regardless of their social positions. Today, this hard labor is left to rice transplant machines. (The Image 7). However, traditional-style rice planting festivals are held in various regions to prey for a good harvest. In Japan “Autumn Festivals” are held across the country to thank deities for the harvest of the year when every autumn comes. The scale of autumn festivals varies in areas but some are tremendous and large-scaled like the Image 8. As you can see, this festival which is held in Niihama City, Ehime Prefecture, features huge and beautiful 52 portable Shinto shrines. Rice harvest festivals are not limited to just common people. The day of 23 November is designated as a national holiday named “Labor Thanksgiving Day”. It is also the same day as one of the Shinto ceremonial offering in the Imperial Palace by an emperor of newly-harvested rice to deities. Don’t be surprised. The man who reaps rice is his Imperial Majesty. You can easily understand how much important rice harvest is in Japan. Japanese is to rice what Westerners is to bread. Most of the Japanese people eat rice every day. For this reason, the Japanese government implemented a policy that nation’s rice self-sufficiency ratio kept over 100 percent. Nevertheless, Japan suffered unprecedented cold summer damage in 1993 and the amount of rice crop decreased by 30 percent compared with that of average year. It was a comic episode that even rice lovers Japanese din not know Indica rice which was so popular in south-eastern Asia. Japonica rice is sticky and we can enjoy rice balls like the Image 2. On the other hand, the less sticky Indica rice is, the more it absorbs water, which means curry and rice or pilaf go well with Indica rice. The typical cuisine is nasi goreng of Indonesia or Malayasia and curry and rice of India or Thailand. Japonica rice is essential for washoku or Japanese cuisine and Indica rice for the cuisines of south-eastern countries. The types of rice are diverse. This is why the diversity brings unique foods all over the world. How sticky the rice cake is! It is estimated that there are 20,000 breed varieties of rice. I have introduced Japonica and Indica rice. And there are two main types of Japonica. One is non-glutinous rice called “uruchi-mai” which is suitable for boiled rice or rice balls and so on, of course, including sushi. 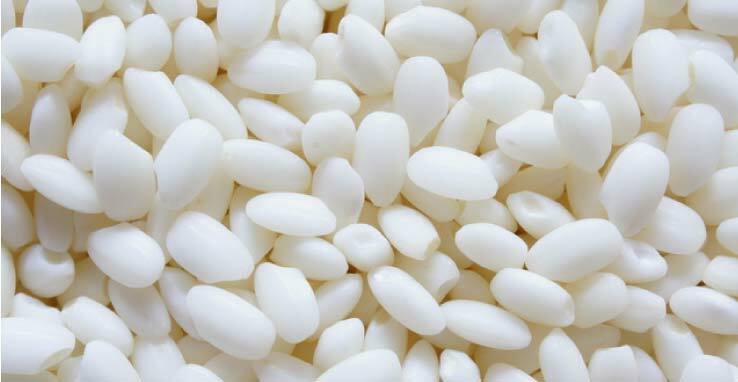 Another is glutinous one called “mochi-gome” which is sticky and can be easily processed into rice cake or crackers like the Image 16 called “arare”. Rice cake can be eaten by both boiling and broiling. On New Year day, Japanese eat a rice cake soup called “ozo-ni” with boiled vegetables and fish-jelly products kamaboko. It is believed that when deities pay a visit to each home on New Year day, people welcome them for decorating rice cake. A rice cake soup is shared with the deities. This common custom is said to lead to an abundant harvest of the year. Today, most Japanese are not aware of this interesting origin but eat the soup customarily. However, the importance of rice takes root in Japanese unconscious mind. c 2015 APTINET Aomori Pref. All rights reserved. Soldiers, twenty centuries’ rice cultivation history looks down upon you. Here is Inakadate village (A link to the location), Aomori Prefecture whose famous sightseeing spot is the works of paddy art. By transplanting a wide variety of rice seedlings like the Image 11 according to an underwriting, these wonderful picture will appear in a harvest season. You can command a view of unique art from a tall lookout. This project started in 1993. However, it was difficult to form perfect-shaped pictures. People once tried to re-create “Mona Lisa” in the paddy fields. Unfortunately, “she” looks very fat because people drew her out of perspective. After years of efforts, the rice paddy art has been now developed into elaborated art works. In the explanation of ozo-ni.